In life, there are certain things that can only be discovered by doing. Case in point: owning a Jeep. As the proud owner of a vintage CJ-7 going on 10 years now, I’ve learned the hard — and, admittedly, sometimes fun — way about the do’s and don’ts of maintaining this type of vehicle. Following are my top 4 tips if you’re new to Jeep ownership. Whether you’re driving a Jeep Wrangler or a Grand Cherokee, these tips will apply. Quite honestly, I wish I could go back in time and tell these to my younger, Jeep-owning self. They would have saved me some heartache — not to mention time and money. 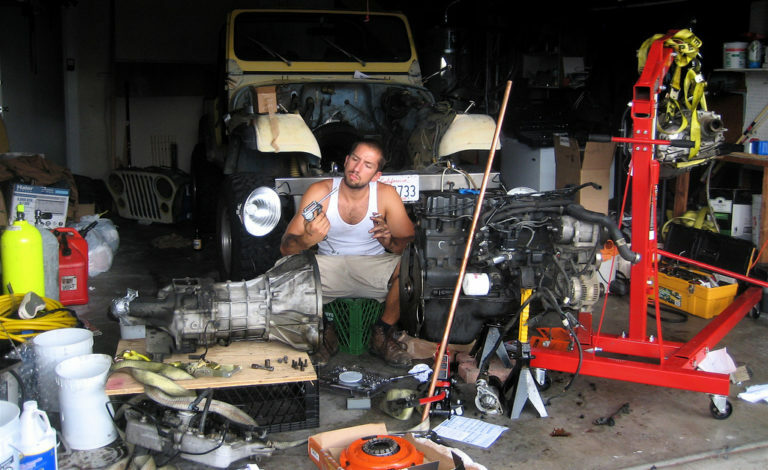 #1 – Find a good auto mechanic. It’s not that Jeeps aren’t dependable, because they are. It’s just that having work done on this type of rig requires considerable knowledge and expertise — particularly for older, manual models. Plus, as the owner of a sport vehicle, I can assure you that regular maintenance and upkeep are now part of your future. Finding a skilled and reputable auto mechanic for your ride should go beyond simply looking in the phone book. You’ll want to do some solid research on mechanics in your area and pay close attention to word-of-mouth testimonials from other Jeep owners. Trust me, I know — finding the right mechanic before you need work done on your Jeep will keep you from scrambling when you’re in a pinch later. Although the attention-grabbing name (death wobble) may be a little overly dramatic, any Jeep — and, really any 4×4 — is likely to wobble at certain speeds, thereby causing a potentially dangerous situation in terms of rollover potential. This wobbling, which occurs because of vibration in the front wheels, typically is the result of an overloaded front suspension system. Indeed, there are lot of special parts and add-ons when it comes to Jeeps. These components — such as lift kits or big tires — can easily throw off alignment. So it’s important to make sure that any stock parts are bolted down correctly and not interfering with the streamlining of your system. Taking your Jeep to a reputable auto mechanic to modify and balance your vehicle is a must in order to rectify the problem (see #1 above). As a Jeep owner, you’re part of a special club now. People who drive Jeeps consider themselves a unique band of adventurers who enjoy all things about this classic American car. One of the most basic ways to recognize and show respect and solidarity among drivers on the road is through the Jeep wave (yes, there really is such a thing) — which involves a specific hand gesture to a Jeep driver passing you on the other side of the road. The Jeep wave is taken so seriously that there are stories of Jeep drivers electing to not help out stuck Jeep drivers who didn’t wave at them. Although it may sound ridiculous, it took me a while to catch on to this tradition. And, in hindsight, I feel pretty darn embarrassed — not to mention disrespectful to my fellow Jeep-mates. #4 – Relax and have fun. While this tip may go without saying, you’d be surprised at how many Jeep owners garage their rigs or treat them as trophy vehicles — thereby missing out on the true fun of owning this type of ride. For Pete’s sake, it’s a Jeep, so don’t be afraid of dirt or even a few dents (again, #1 above). Make off-road adventures and other destination rides a regular part of your schedule. Join a local or regional Jeep club. Try to attend an annual Jeep festival or two. You’ll love the camaraderie and will likely make lasting friendships, both on and off the road. In short, make the most of your Jeeping experience and jump in with both feet — er, four tires, that is — first.